During pregnancy, learn about the correctThe development of the child can be done with prenatal biochemical screening. The modern method of investigation enables specialists to detect pathology at an early stage of its development and take measures aimed at solving the problem. Prenatal screening is carried out on different terms of pregnancy, it is absolutely safe, painless and highly effective. Prenatal (prenatal) biochemical screeningIt is recommended to women with the purpose of timely detection of anomalies of chromosomal and genetic origin. The procedure includes a triple ultrasound and a biochemical blood test. In obstetrics and gynecology, the term "screening"Specialists imply safe mass research, the purpose of which is to identify at-risk groups of intrauterine anomalies. 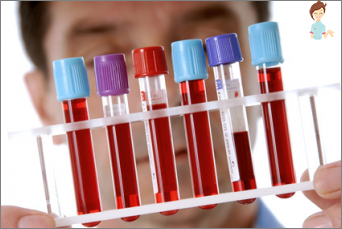 Biochemical blood tests, which allow to determine the development of pathology, because the composition of specific blood substances in this case varies significantly. It should be noted that the firstPrenatal screening and all subsequent does not allow specialists to diagnose, it only makes it possible to identify pregnant women with an increased risk of developing pathologies. To determine the exact diagnosis, additional studies of the fetal status - ultrasound and invasive diagnostics - are needed. Evaluation of fetal development is carried out exclusivelyAll pregnant women in 1, 2 and 3 trimesters. The first time a woman undergoes a checkup from the 10th to the 14th week of pregnancy, the optimal timing is 11-13 weeks. 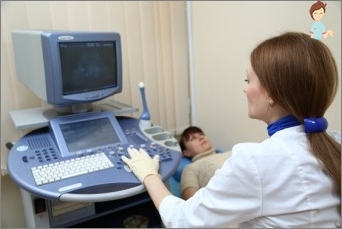 Specialists conduct ultrasound, the purpose of which -Put an evaluation of the development of the fetus according to the timing of pregnancy, and make measurements of the collar area. This term in obstetrics and gynecology indicates the area of ​​fluid accumulation in the neck of the fetus between the skin and soft tissues. The normal indication of the thickness of the collar space is less than 3 mm. In the case when the indicators exceed the norm, there is a risk of developing some fetal anomalies. If there are suspicions of deviations in the development of the embryo, the doctor can not make unreasonable diagnoses, additional studies will be needed to confirm suspicions. For this purpose, a biochemical blood test is carried out in the 1 trimester of pregnancy at a period of 10-13 weeks. This diagnostic method is known as "Double test", Spend it only after ultrasound, and it is aimed at determining in the blood of pregnant women the level of two proteins - RAPP-R and hCG. This method of antenatal research has another name - prenatal screening of trisomy. In principle, these indications remain the same not only for prenatal screening of the first trimester, but also for the subsequent two - the second and third. Conducting prenatal screening in 1 trimesterAllows to detect also such widespread anomalies as the syndrome of Patau, Turner, Corneli de Largue. To conduct the procedure requires the presence of ultrasound results, done no earlier than a week before the analysis. With the results obtained, a woman should visit the office of a geneticist. The specialist, using a special program, taking into account the analysis, assesses the risks of a woman in this pregnancy. In calculating individual risks, a geneticist takes into account the age of a woman, her weight, ethnicity, the presence of chronic diseases and hereditary diseases in her immediate family. After a doctor's consultation, a pregnant womanA woman can be sent for a follow-up - a chorionic villus biopsy. This is an invasive method, the procedure refers to complex manipulations, when a specialist introduces a tool for sampling the chorion through the abdominal wall or cervical canal. This term indicates the structure of the placenta. A biopsy is a very dangerous procedure, if it is incorrectly performed, bleeding can occur with a subsequent miscarriage. Prenatal screening in the 2nd trimester recommendedIn 16-18 weeks, but can be held up to 20 weeks. During this period in a pregnant woman the blood is taken for AFP, hCG, free estriol, the study is also known under the name "Triple biochemical screening". The doctor assesses the risks of developing anomalies that may occur during this gestation period, taking into account the results of ultrasound and the conclusion of genetics made in the first trimester. These methods of 2 prenatal screening also require intervention in the mother's body and can lead, like a chorionic biopsy, to fetal death. Ultrasound in the 2nd trimester is carried out for 20-24 weeks. The fetal ultrasound is carried out in the third trimester - at 32-34 weeks. At this time, too late anomalies may develop, which can be seen with the help of ultrasound. Each trimester of pregnancy is characterized byIts peculiarities of fetal development, and it is not necessary to exclude the risks of anomalies, which will be confirmed by prenatal screening and qualified specialists.